Evocative symbolic imagery beautifully illustrates the pains and complexity of growing up. The tradition of the wise child in literature is long: from Mary Lennox in The Secret Garden to Scout Finch in To Kill a Mockingbird, we have learned a lot about the adult world by looking through the eyes of a child. With her beautifully written debut novel, Margot Griffiths follows in the tradition of Burnett and Lee by exposing society’s hypocrisies through a child’s coming-of-age. 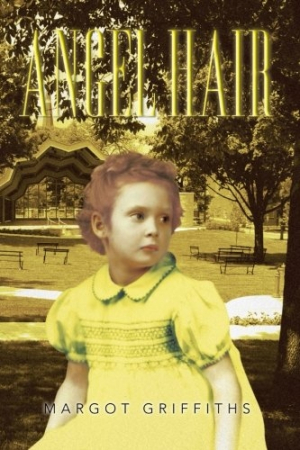 Angel Hair paints a moving portrait of Myfanwy Morgan, an observant and resourceful girl growing up in Victoria, British Columbia, in the 1960s, when assumptions about men’s and women’s roles were shifting right under her feet. Griffiths convincingly places Myfanwy, or Maffy, in the aptly named Uplands, a suburban center of social climbing that doesn’t quite suit her quirky family. While the neighbors trade snarky gossip about husbands with faltering careers and wives with garish remodeling projects, Maffy’s family recites poetry, studies the stars, and rewrites fairy tales. They also drink too much, suffer unpredictable mood swings, and leave much of the grown-up work to ten-year-old Maffy, whose innocent yet world-weary perspective Griffith captures expertly. When Maffy comes home from school, for instance, she’s brimming with pride over her model of Venus, like any child whose teacher picked her project as the best. Still, she is not at all surprised to stumble over her father’s rum bottles on the way in, or to meet with her mother’s indifference, even wrath, when she opens the door. She’s seen it all before. Griffiths never interrupts the story to explain Maffy to us but instead shows us her life through powerful moments like this quick turn from excited kid to jaded survivor. Even though she doesn’t shy away from life’s hard lessons—Maffy has to not only cope with her unstable parents but also take over raising her handicapped younger brother—Griffiths softens the blow with lyrical turns of phrase and evocative symbolic imagery. The angel hair of the title, for example, adorns the Christmas tree Maffy carefully decorates each year, each piece of tinsel reflecting the light but also capable of cutting deeply, like “spun glass.” Or, perhaps, like family. It’s an exquisite image that contrasts so clearly with the snooty neighbor’s pink-coated tree that shows no sign of its green and growing origins. Griffiths’s writing is rich with these images, adding sophisticated depth and dimension to the story. The story is not without drama—suspicious deaths and scandalous couplings abound—but the plot seems secondary to the complex rendering of time, place, and emotion. Particularly poignant are the parallels Griffiths draws between adolescence and middle age. Snatches of conversations shouted between Maffy and her friend Janna as they bicycle around town evoke the girls’ growing independence, for instance, while Maffy’s mother quotes Tennyson on the looming regrets of old age, mourning the loss of freedom that comes with motherhood. Angel Hair, with its opening quote from Wordsworth—“Our simple childhood sits upon a throne / That hath more power than all the elements”—and the softly-lit child’s portrait on the cover, seems at first glance to be solely an ode to youth and innocence. But read on and you’ll find a multilayered world that reflects the complex process of growing up.